Next weekend I'm heading to Monroe Michigan for a reenactment commemorating the Battle of Frenchtown. 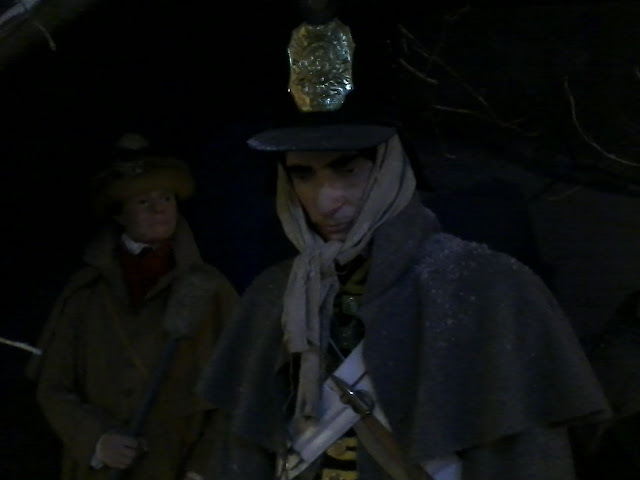 The ensuing massacre of wounded prisoners there begat the cry "Remember the Raisin." According to the National Park Service, this battle resulted in the most American fatalities of any single War of 1812 battle. Procter's most solid forces were the 1st Battalion, 41st Regiment of Foot. He had about 270 of them available for the battle, including the elite flank companies, the grenadiers and the light infantry. They made up the lion's share of his regular troops. 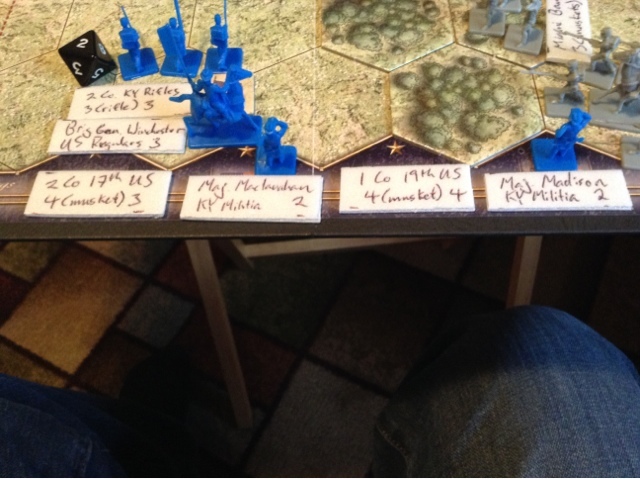 In this scenario I put them together on the British left flank, but Procter may have inter-dispersed regular companies with his unreliable Canadian units. 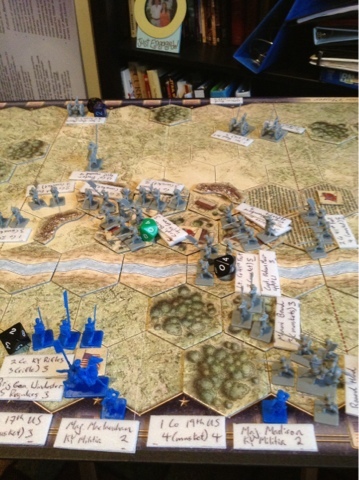 In this game, the two flank companies and the two "center" or fusilier companies walk through the weak position of the American 17th and 19th Regiment companies. The Americans flee Chief Roundhead's warriors, running into the relative safety of town. What happened differently is that the British regulars leveled their bayonets and charged into the Kentucky positions at the Puncheon Fence around Frenchtown. 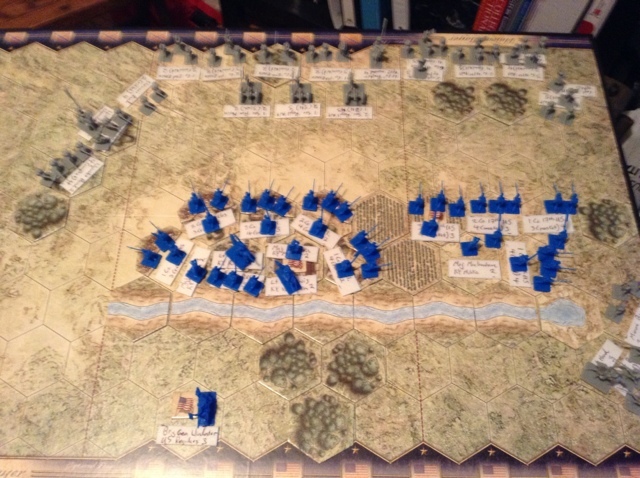 The tactical cover of the fence was nullified and the better British units swarmed over. Winchester, commanding from the town (in the actual battle he arrived on the American right wing to rally the regulars before being captured by Roundhead. Colonels Lewis and Allen were shot down trying to lead a sortie to reinforce the regulars, leaving Majors Graves and Madison to command the remaining troops), was faced with a dilemma. He could try to counterattack with the Kentucky units and force the British out of their foothold, or make for Hull's Road south of town before Indian forces closed the noose. He (meaning I) chose the latter. I should clarify that I've written in rules that allow a commander to save points by withdrawing troops before the scenario ends. This is kind of like taking a bet off the table after you find out you lose, but it's more realistic since it allows for tactical victories. Each unit represents a company of 30-120 soldiers. Individual figures may be detached from a unit as "skirmishers" reflecting the wide use of pickets and light infantry tactics even among line infantry during the war. Winchester leads his men out of town. On the American left, a scratch force of Kentucky militia and volunteer rifles sends Walk-in-the-Water packing, opening up a path to safety. 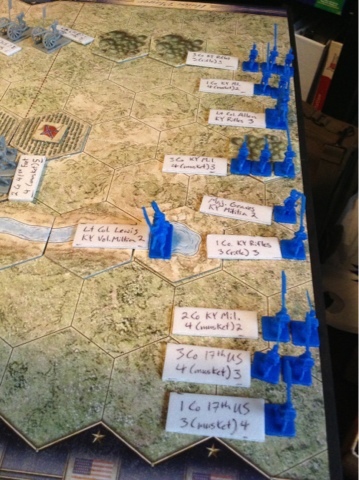 The dice on the table track morale levels. Morale reflects the importance of discipline and cohesion relative to a unit's striking power-- or perhaps, for undisciplined groups such as Volunteer Riflemen or Indians, their skill at war or woodcraft. In the end, only one company of Kentucky rifles is left on the board, along with Winchester (during the actual battle Winchester gave up his chance to make a getaway and was captured trying to rally his men). To explain the units: below the unit or field officer's name, the first value (left) represents strength, then the type of arm they carry, then "morale". 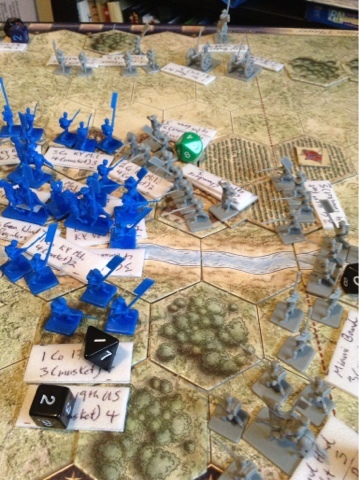 Morale, rather than strength, determines the number of dice a unit rolls to hit a target or attack. 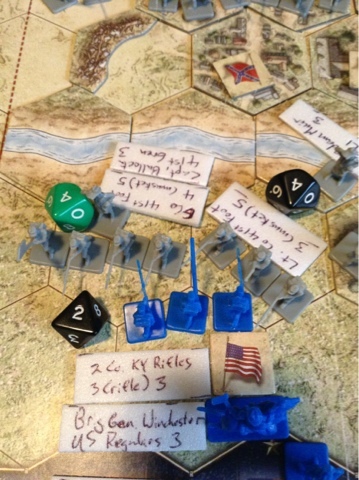 After only 45 minutes of fighting, the British have taken the town and all the objective points, along with destroying two companies of US regulars and bagging two militia Majors (historically, Major Maclanahan was the highest ranking officer to escape). A number of American units escape down Hull's Road, far more than the approximately 30 men who got away from the historical defeat. One bright side to the battle for the British is that they are better off at the end than they were historically. 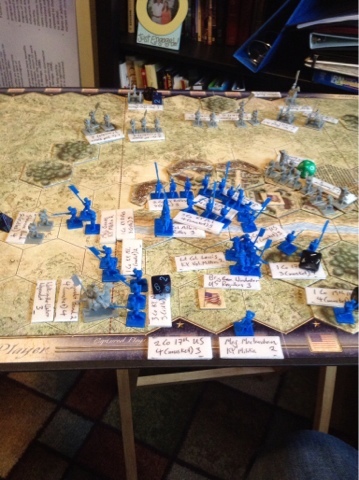 The 1/41st has taken few losses and is prepared to fight another battle.